I have been radio silent for the past few weeks on the blog but not on Twitter! 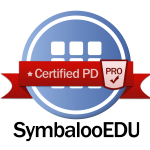 I have been doing many professional developments for teachers and schools (the presentations can be found under the Professional Development tab) and have done some training on many different apps and web tools. The one I ALWAYS show and spend time on is SymbalooEDU! This amazing and FREE web resource allows teachers to create a “webmix” that has purposeful tiles (I liken them to icons) that are links to web content, videos, flicker albums, Glogsters and more! There are thousands of shared webmixes on hundreds of subjects and a quick search will allow you to find a webmix on your next lesson and add and delete to make it your own. If you teach 2nd grade and do a unit on Dinosaurs, then a Dino webmix is what you will use in your lesson. If a lesson on Civil Rights Leaders is in your future there is a webmix for that! Below is a webmix I created and add to often of resources that I recommend to teachers. (you will need to scroll to see it in the post.) I call it my PLE – Tabaldo On Tech – I simply have teachers add this webmix to their SymbalooEDU and they have all the resources and more at their finger tips.